Exploring the hidden secrets in the caves of Ko Phi Phi Leh Island in Thailand is a must do when visiting Phuket or Phi Phi Island. 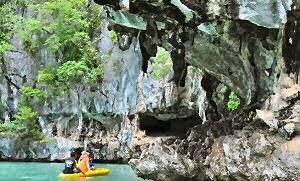 The only way to enter the hidden treasures inside the famous lime stone rocks of the Phi Phi islands is signing up for a canoe tour. We signed up with Sea Canoe and the journey will only be organized during the low tide, as that's the only time the water is low enough for you to enter the inside of the lime rocks. Although the weather was cloudy, it is rainy season after all - so actually happy we weren't flushed out by a rain storm-, it is well worth the trip. Each canoe has his own "driver", meaning you just sit back, relax, enjoy the silence of the sea and explore with the eco friendly guides what's inside. 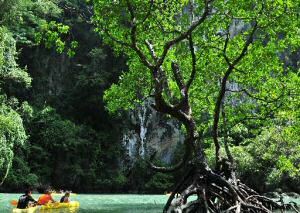 Who would have imagined to find monkeys inside these Koh Phi Phi Leh hidden lagoons? Mangroves? Crabs and mudskippers? Birds of Prey? Amazing! Ko Phi Phi Leh and Ko Phi Phi Don are less than 50 km away from both Phuket Island and Krabi town on the west coast of southern Thailand.